Dramatic prominences can sometimes be seen looming just beyond the edge of the sun. Such was the case at he begining of March week as a large prominence, visible below, highlighted a highly active recent Sun. A waving sea of hot gas is visible in the foreground chromosphere in great detail as it was imaged in one specific color of light emitted by hydrogen. A solar prominence is a cloud of solar gas held just above the surface by the Sun's magnetic field. The Earth, illustrated in the inset, is smaller than the prominence. Although very hot, prominences typically appear dark when viewed against the Sun, since they are slightly cooler than the photosphere below them. A quiescent prominence typically lasts about a month, and may erupt in a Coronal Mass Ejection (CME) expelling hot gas into the Solar System, some of which may strike the Earth and trigger auroras. Because it's so wide, the entire sunspot complex would not fit on the page. Dozens of dark cores are present in Ahmad's image. The largest ones are about the size of Earth. Also note the fine granulation of the solar surface. Those are Texas-sized bubbles of plasma rising and falling around the sunspots like water boiling on top of a hot stove. The magnetic canopy of AR1981-AR1982 harbors energy for significant eruptions. NOAA forecasters estimate a 50% chance of M-class flares and a 5% chance of X-class flares on Feb. 23rd. The assymetric CME could deliver a glancing blow to Earth's magnetic field on January 7th, possibly sparking G1-class geomagnetic storms. NOAA analysts are still processing the CME imagery for a more precise forecast. However, there might be two CMEs in there. After the first cloud from sunspot AR1944 emerged, a second cloud was propelled off the sun's western limb by departing sunspot AR1936. The mixture of CMEs complicates analysis of this event. The movie shows a dark filament of plasma racing away from the blast site, but most of the material fell back to the stellar surface. Nevertheless, the explosion did produce a CME that could deliver a glancing blow to Earth's magnetic field later this week. NOAA analysts are still evaluating this possibility. The M9-flare of New Year's Day followed close on the heels of an M6-flare on New Year's Eve. Sunspot AR1936 produced both explosions. The New Year's Eve event produced a minor, slow-moving CME that is not expected to disturb Earth's magnetic field if and when it does arrive. 2013 ended with a bang. 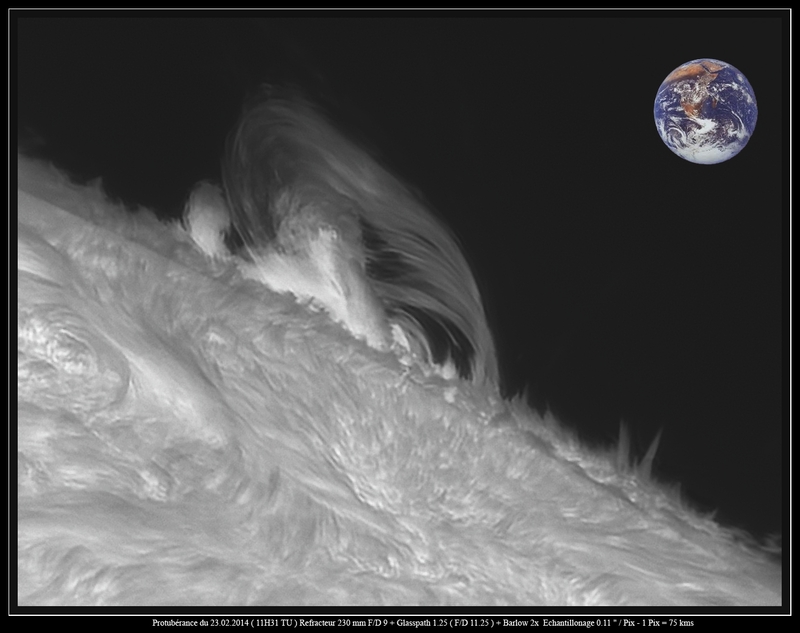 At 21:58 UT on Dec. 31st, sunspot AR1936 erupted, producing a strong M6-class solar flare. 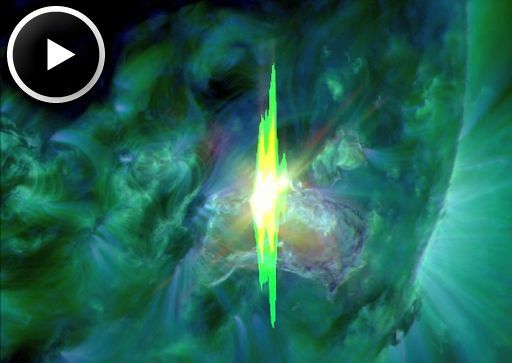 NASA's Solar Dynamics Observatory recorded the extreme ultraviolet flash (see video below). Amateur images of the explosion show a dark filament of plasma flying away from the blast site. The explosion probably hurled a coronal mass ejection (CME) into space which could deliver a glancing blow to Earth's magnetic field later this week. We'll find out more about this possibility when coronograph data from SOHO and STEREO reach Earth. Stay tuned. forecasters estimate a 40% chance of M-class flares and a 10% chance of X-flares on Jan. 1st. SIX SUNSPOTS ON THE SUN, two of them are facing Earth (1934 and 1936) and have 'beta-gamma' magnetic fields that contain sufficent energy for strong flares. Both have been quiet for some days and they show no signs of an imminent eruption. This has prompted NOAA forecasters to place low odds on flares today: a 25% chance of M-flares and a 1% chance X-flares however if they did erupt, we would get hit. Sun expected to 'flip upside down' as magnetic field reverses its polarity - this was the headline of the science section in today's ( Wednesday 25 December 2013) online Telegraph. No wonder people are confused and the media is going crazy with theories of gloom and disaster when such drivel is being put out by the more serious press. They ignored or chose to ignore but probably just did not bother to check that only the day before, one of the latest papers on this was published in the journal "Astronomy and Astrophysics" entitled "Reversals of the solar magnetic dipole in the light of observational data and simple dynamo models" by D. Moss, V. V. Pipin, D. Sokolo and J. T. Hoeksema. It says that observed data from the Wilcox Solar Observatory matches models of how the Sun's internal dynamo works. You can't tell by looking, but scientists say the Sun has just undergone an important change. Our star's magnetic field has flipped.The Sun's magnetic north pole, which was in the northern hemisphere just a few months ago, now points south. It's a topsy-turvy situation, but not an unexpected one. "This always happens around the time of solar maximum," says David Hathaway, a solar physicist at the Marshall Space Flight Center. "The magnetic poles exchange places at the peak of the sunspot cycle. In fact, it's a good indication that Solar Max is really here." Above: Sunspot counts, plotted here against an x-ray image of the Sun, are nearing their maximum for the current solar cycle. The Sun's magnetic poles will remain as they are now, with the north magnetic pole pointing through the Sun's southern hemisphere, until the year 2012 when they will reverse again. This transition happens, as far as we know, at the peak of every 11-year sunspot cycle -- like clockwork. Not quite clockwork as it is overdue and has not yet happened. It is not a simple matter of looking at a solar compass needle and watching it flip. Detailed observations of sunspots have been obtained by the Royal Greenwich Observatory since 1874. These observations include information on the sizes and positions of sunspots as well as their numbers. These data shows that sunspots do not appear at random over the surface of the sun but are concentrated in two latitude bands on either side of the equator. A butterfly diagram (below) showing the positions of the spots for each rotation of the sun since May 1874 shows that these bands first form at mid-latitudes, widen, and then move toward the equator as each cycle progresses. Blue denotes North polarity of the sunspot and yellow South polarity. If you note the colour showing at 90N and 90S you can tell if its north or south and I think that you will agree that its too early to tell but thelast measurements show blue is beginning to fade away at the top. Note that this chart was last updated in July 2013 when the data was made available but is done at monthly intervals. What is really really interesting is when a climate temperature chart is placed on top of this one. But I am not going there today! Though not really a "Solar" item, the STEREO-B probe (Solar TErrestrial RElations Observatory) together with its A companion was launched for observing the Sun, 'A' flying in our orbit around the Sun but ahead of Earth and the other 'B' also on our orbit but trailing Earth, thus providing a "stereo" view.